Director Robert Zemeckis and his team have endeavoured to remain faithful to Charles Dickens’ original short story, so Jim Carrey doesn’t trot out his customary ad-libs – which would’ve shattered the credibility of this serious, old-time morality tale. By the end of the movie, Dicken’s ‘message’ (i.e. of compassion toward the less fortunate) is made manifest in the least subtle way, with nothing being spared in the way of stereoscopic and other effects work. Zemeckis appears to be wed to the ‘motion capture’ technique of animation (as witness his previous animated 3-D movies, the execrable Beowulf and the delightful Polar Express). This system employs hundreds of electronic sensors which are attached to actors’ bodies and faces, which inform the movement and performance of their animated counterparts. I’m not crazy about this technique, as, in its present incarnation, it lacks the ability of either live performances or other types of animation to completely engage and persuade me. These ‘virtual actors’ come across as rather rigid – and squint-eyed – to my disconcerted eye. 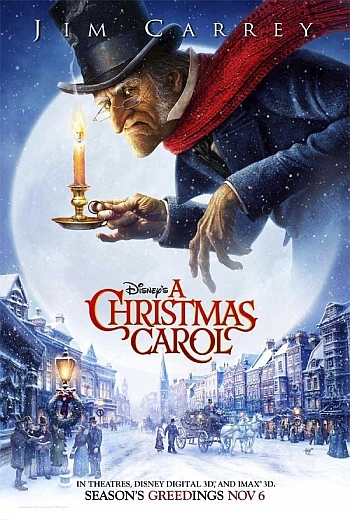 As the tight-wadded Ebenezer Scrooge, Jim Carrey (or, at least, his animated avatar) is nastier than he’s even been, yet gradually reveals more of his humanity and vulnerability as the tale unfolds and his long-buried compassion is brought to the fore. 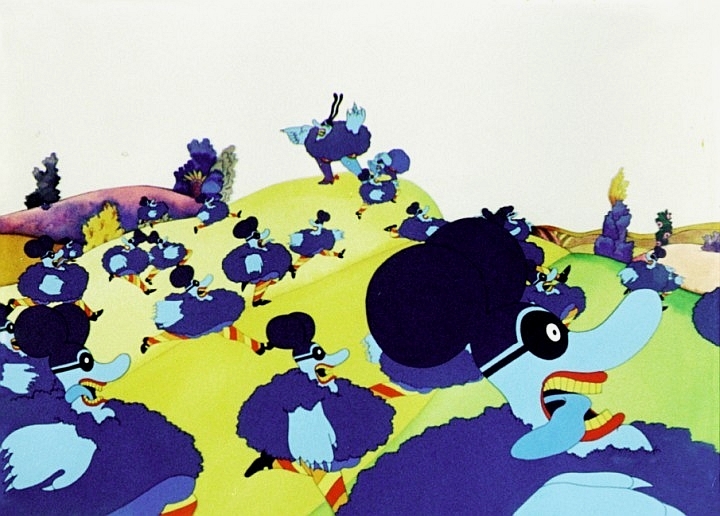 Robert “Back to the Future” Zemeckis is currently engaging with the folks at Disney regarding a 3-D remake of The Beatles’ animated psychedelic fantasy, Yellow Submarine . Zemeckis is one of the prominent poster-boys of the current 3-D revival, and this feature will be his fourth crack at 3-D; his first having been 2004’s The Polar Express, which we didn’t see locally in 3-D as the 3-D version was only released in a handful of IMAX 3-D venues around the world. The popular director’s second 3-D movie was the dreadful Beowulf, which we had the dubious honour of catching at local 3-D theatres. Zemeckis’s third 3-D effort is the Jim Carrey vehicle, A Christmas Carol, which opens in 3-D (and 2-D, for those who care) on November 6th 2009 – in the US, UK and SA simultaneously.